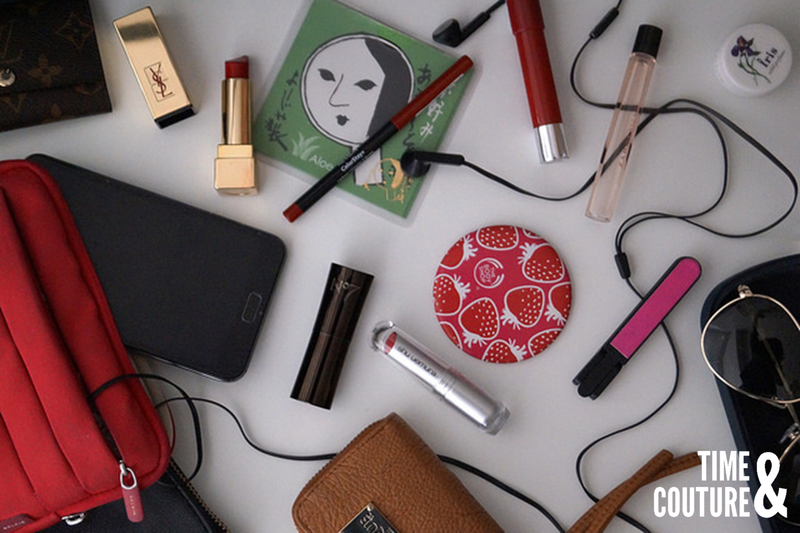 TIME & COUTURE: What's in my Bag? Having been raised to be very money-conscious, the only products that I use are usually ones that were on offer or gifts during birthdays and Christmas. However for the past few months, I have adopted a new formula to slim down the amount of beauty products that I buy. Instead of impulse buying (you know the whole "it was on sale so I had to have it" kind of attitude), I would save the money I would have otherwise spent on drugstore brands that I hardly used, and splurge on a good quality, high-end purchase. I do still waver at times and literally have to force myself to walk past the 3 for 2s. My bargain-hunter state of mind has yet to leave me, which is why I found it frustratingly difficult to justify £25 for a tube of lipstick. I'm so glad I did, hand the money over I mean. Rummaging through my bag today, I thought I'd let you guys have a look into what essentials make it into my bag on a daily basis. You may have noticed that I have a lot of lip products (my favourite being Le Rouge by Yves Saint Laurent used alongside the Revlon ColorStay Lipliner in red), some may say I have too much, but I am way too busy to remember to put back the items I take out. So without further ado, glimpse away! I hope you enjoyed that little sneak peek, and see you next time! Posted by Unknown at 14:47 Labels: Time & Couture, What's in my Bag?